Singer. Rebel. Outlaw. Hero. With his driving freight-train chords, steel-eyed intensity and a voice as dark as the night, the legendary "Man in Black" revolutionized music - and forged his legacy as a genuine American icon. 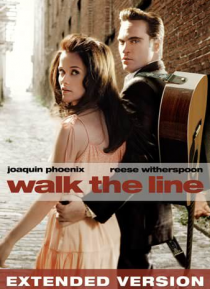 Joaquin Phoenix and Reese Witherspoon star (and sing) as Johnny Cash and June Carter in this inspiring true story of one man's unwavering devotion to his sound, his message an… d the greatest love of his life.